It's just a liiiiittle bit wet today! The rain might not be as heavy as on the thunderstorm photos but it started sometimes yesterday evening and have pretty much been going on since. It's really cold, gloomy and WET at the moment. 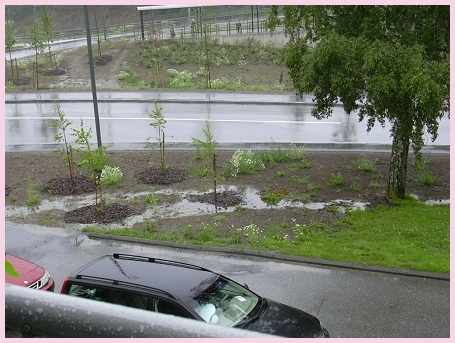 But I guess I shouldn't complain since there are other parts of Sweden that's gotten flooded recently and the only thing flooded here are the flowerpots and saucers that I have to keep an eye one. 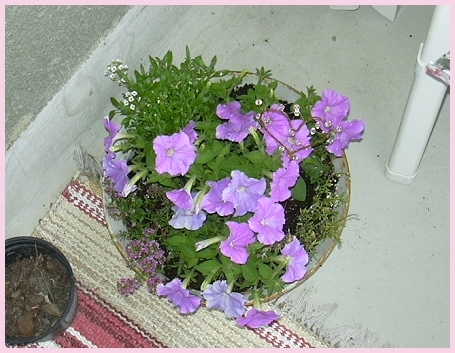 I've had to put the big bowl of Petunias in on the floor at the dry end of the balcony since there's no drainage hole in the bottom. But at least I don't have to water... that much... There ARE still a few of the pots on the window sill that's sheltered from the rain. BTW, I've just found out that they're NOT building apartments behind the red house. They're building a parking lot and some kind of bus terminal (I don't know yet if that will include a house or not). 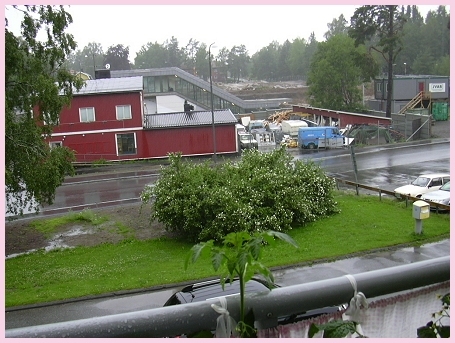 The apartments will be built further away from me where I can't see them.